So far huber3 has created 9 blog entries. Jo Evans/Contributed photo. The Hubert Laws Quintet performs at the Red Clay Jazz Festival June 25. 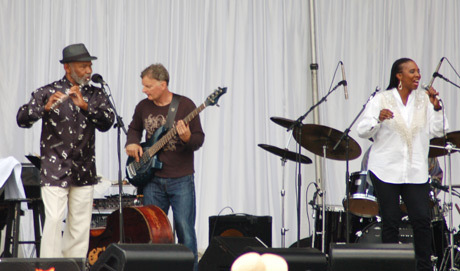 From left is David Budway, piano; John Leftwhich, bass; Ralph Penland, drums; Hubert Laws, flute; and Rob Mullins, keyboards. Is this why his jazz quintet can be so tight one moment, showing their decades of playing together, and then the next minute cut loose with surprising improvisations? Laws took a sip of bottled water and stretched his lean frame. “I’ve played with great symphony orchestras, and I’ve played some of the great classical works,” he said. “I used to work so much on classical concerti and sonatas and such — doing difficult things on my instrument. Then I said to myself, ‘Wait a second! There’s something else here I need to spend more time on. The 71 year-old musician said he started improvising when he was six years old in his home town of Houston, Texas, long before he first played with the Jazz Crusaders at age 15, well before he played with the artists who later formed the Modern Jazz Sextet. He subsequently studied at Juilliard, joined the New York Metropolitan Opera Orchestra and played with the New York Philharmonic Orchestra before he released his first album, The Laws of Jazz, in 1964. By the time Hubert Laws gained national and international celebrity in the 1970s, standing on equal footing with jazz flutist Herbie Mann, he had mastered his craft. Laws ever since has been sought after to play with such jazz, classical and pop musicians as George Benson, Leonard Bernstein, Aretha Franklin, Ella Fitzgerald, Lena Horne, Quincy Jones, Paul McCartney, Sérgio Mendes, Carly Simon, Paul Simon, Sarah Vaughan, Clark Terry, McCoy Tyner, Nancy Wilson, and Stevie Wonder. Apart from an almost 10-year sabbatical in the 1980s to be “hands-on with with my two kids in their formative years,” Laws has never stopped playing and recording. In fact, he said, his quintet will soon enter his Los Angeles studio to re-record his 1970s signature piece, “The Rite of Spring” by Igor Stravinsky. The members of his quintet — David Budway, piano; Ralph Penland, drums; John Leftwich, bass; Rob Mullins, keyboards — each has a lively careers of his own, yet the quintet still comes together for special concerts, such as a recent performance in Cape Town, South Africa. 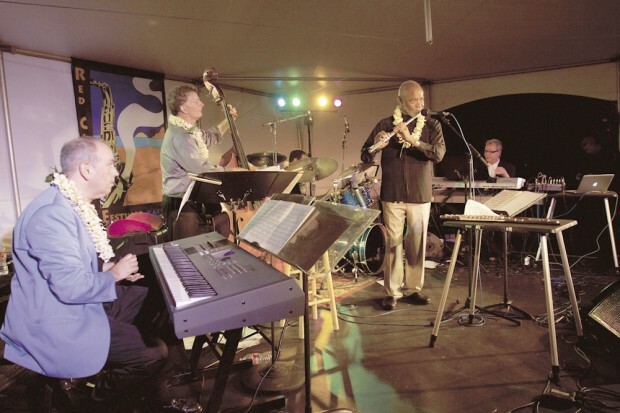 Although he has performed elsewhere in Hawai‘i, Laws said his quintet’s appearance at the Red Clay Jazz Festival was his first visit to Kaua‘i. Copyright 2011 The Garden Island. All rights reserved. This material may not be published, broadcast, rewritten or redistributed. At the annual NEA Jazz Masters awards ceremony held on Tuesday evening at Rose Hall at Jazz at Lincoln Center, the themes of community and family kept surfacing and not just because, for the first time in its history, the organization included a family—the Marsalis family—in its slate of honorees. 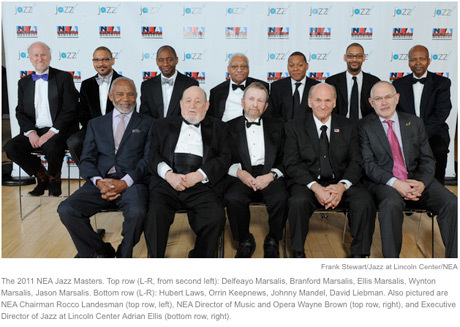 Besides the Marsalis family—father Ellis, along with sons Wynton, Branford, Delfeayo and Jason—this year’s NEA Jazz Masters were Hubert Laws, David Liebman, Johnny Mandel and Orrin Keepnews. Ranging in age from 64 (Liebman) to 87 (Keepnews), this year’s class of Jazz Masters came from very different backgrounds but all shared a lifelong love and commitment to the music. The induction of the entire music-playing Marsalis family along with paterfamilias Ellis was not just the elephant in the room, it was the room itself because the event was held in the house that Wynton built, with his own orchestra as the show’s band. Any implied quid pro quo aside, it would be hard, maybe impossible, to imagine a better venue for the awards ceremony. From the seating for the awardees behind the stage to the overhead video screen for the pre-taped segments, it looked like the perfect theatrical set for the gala. The meticulously produced show moved along quickly, but still allowed for the occasional accident that makes an award show memorable. The show was exactly two hours without intermission, but it never lagged, thanks to a minimum of pomp and ceremony. After an introduction by NEA chairman Rocco Landesman, each awardee was saluted with a well-produced video clip, introduced by a close associate and then allowed a short acceptance speech, with a musical number closing out their segment. The JALC orchestra fit that role like a glove, whether accompanying one of the inductees or saluting them with a performance of an appropriate composition. The group has benefitted greatly from all its hard work both at home and on the road. Is there a jazz big band around that plays more during the course of the year? The result is a tight unit that neither overplays nor sounds imbalanced. It also features some exceptional brass and saxophone players, such as Marcus Printup, Walter Blanding, Sherman Irby, Ryan Kisor and Victor Goines. Each of the inductees was introduced by an NEA Jazz Master from previous years, reinforcing the sense of community and family that was so often cited. And many of the previous inductees were there sitting in the first five rows of so, having gotten together for a lunch earlier that day. Like some sort of fraternity or secret society, the Jazz Masters revel in their association with each other, as proud of each other as of themselves. Among the Jazz Masters in attendance were Kenny Barron, Candido Camero, Jon Hendricks, Lee Konitz, Dan Morgenstern, Annie Ross, George Wein, Frank Wess and Gerald Wilson. As this year’s “jazz advocate” inductee (following Nat Hentoff, George Wein and Dan Morgenstern in previous years), producer Orrin Keepnews was generally the last to be mentioned in the list of nominees, but was the first to be honored on this night, as the segments rolled out in the very egalitarian alphabetical order. In that panel session, Keepnews said that “I’m still the same guy that was I was as a former young man scuffling for a way to do my thing.” The eloquent producer has always had a remarkable way with words, a very long way in fact. Introduced with warmth and wit by Jimmy Heath, Keepnews characteristically took his time drolly trying to explain how someone like him could come to be called a Jazz Master. He said that he estimates that he’s spent about 50 years of his life in the recording studio, but that he is most grateful for the opportunity to work with interesting and talented people whose company he enjoyed. Giving a nod to one of those storied relationships, the JALC orchestra performed Ted Nash’s arrangement of “Re: Person I Knew,” a Bill Evans composition. Keepnews had a lifelong personal and professional relationship with the pianist, as well as with so many other jazz giants such as Thelonious Monk, McCoy Tyner and Sonny Rollins. Introduced by Ron Carter, flutist Hubert Laws movingly talked about how honored he was to be included in the company of so many artists he’s either worked with or admired. 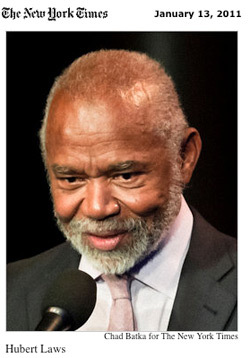 Laws kept his acceptance remarks short, opting instead to spend his allotted time performing a lengthy improvised duet on “Stella By Starlight” with pianist Kenny Barron. If anyone present had any doubts about Laws’ qualifications for the lofty Jazz Masters honor, and likely few if any would, he certainly dispelled them in a powerful display of virtuosity and creativity. In the video clip, lifelong friends and associates Chick Corea and Herbie Hancock talked about Laws’ dedication to his music and about his unique voice on his instrument. Laws said that when he first picked up the flute as a young child, it took him a few days to get a sound out of the flute, but once he did, he never looked back. At the age of 64, the hard-working David Liebman is the “baby” of this year’s class, and perhaps the most currently active as a working musician. At the previous day’s panel, the saxophonist spoke about how important government subsidy is for the arts in general and jazz in particular. “The purpose of a government is to provide four basic services – defense, education, health and culture,” Liebman told the audience of jazz insiders. “It’s important for this music to get money from the government. Liebman lamented that like most established jazz musicians, he works most overseas in Europe. At the ceremony, Liebman reiterated his appreciation that the NEA and other organizations recognize and support achievement in the arts in this country. For the musical part of his segment, Liebman played soprano on an arrangement by Gil Evans of Gershwin’s “Summertime” and “There’s a Boat Dat’s Leavin’ Soon for New York” with the JALC Orchestra, conducted by his old friend (and, Liebman joked, his “boss” at the Manhattan School of Music) Justin DiCioccio. Songwriter and arranger Johnny Mandel reflected on a lifetime spent working with singers and musicians. In both the informal panel and the video at the ceremony, he told his old joke that when he got started in the business, people thought an arranger was someone who moved chairs around. Introducing a performance of his “Shadow of Your Smile” by Wynton Marsalis and the Jazz at Lincoln Center Orchestra, Mandel excitedly told the crowd that he’s been leading a big band of his own these days, after taking over a gig that trumpeter Jack Sheldon didn’t show for. Although originally an accomplished trombonist, Mandel in many ways had more in common with a producer like Keepnews than with his fellow musician inductees. Mandel’s role has largely been to make other people, in his case mostly singers, sound better. Indeed, a good part of the video segment referred to Shirley Horn’s Here’s To Life, a record whose exquisite arrangements by Mandel helped to bring that singer from a cult or insider following to a mainstream audience. Mandel joked at his own expense about his apparent Midas touch, telling how back in the ’70s he was asked to write something silly and stupid for the sluggish part of a new movie. And when he couldn’t come up with anything, he proceeded to get drunk and wrote the melody of “Suicide is Painless,” the theme song of M.A.S.H., a hit tune that he called one of the lousiest things he’d ever written. Go figure, he seemed to say about much of his career. The Marsalis family was the last to be honored and the video tribute made it very clear that father Ellis was to be the focus for the honor. He was introduced by fellow pianist Cedar Walton who said he met Ellis at Dillard University in New Orleans, when both of them were about 19-20 years old. Walton had gone off to college early and Marsalis was attending college classes instead of high school. Although it would be many years before Marsalis devoted himself to jazz education, his relationship with schooling (for himself and others) was established early in his life. In one part of the video clip, Branford talked about how his father’s specialty in teaching jazz was in reaching difficult kids who responded favorably to Ellis’ unique brand of tough love. Accepting the honor on behalf of the family, Ellis credited his wife Dolores with keeping the family together with her love, devotion and first-rate cooking. “She was a chef and she gave that up when she married me,” said Marsalis. “Looking back, I realize how much she sacrificed for a guy like me.” He also said that he was part of the nominating committee for the NEA Jazz Masters awards when they first started over twenty years ago, but never expected that he would ever be a recipient. Like all the honorees, Marsalis seemed entirely humbled by the award. The family then performed as a unit, along with Jason Stewart on bass, on “At the House, In Da Pocket,” a bluesy Blakey-like tune written by Jason Marsalis. The night also included a heartfelt salute to four NEA Jazz Masters who died during 2010 – Abbey Lincoln, Hank Jones, James Moody and Dr. Billy Taylor. Backed by the orchestra, Roberta Gambarini and Jimmy Heath performed “Angel Face,” a song composed by Hank Jones and Abbey Lincoln. The youthful Gambarini was a sublime choice, and not just because of her pure jazz vocal approach and respect for the jazz tradition. She also had collaborated with both Jones and Moody, who held the Italian singer in high regard. This year, both the panel and awards ceremony were broadcast via a video webcast, so that a savvy jazz fan could have one of the best seats in the house for an entertaining show that only comes around once a year. For more information about the honorees, past and present, you can visit the NEA website devoted to the Jazz Masters. See the article on The New York Times website. View an image of the article. Accepting his 2011 NEA Jazz Masters award at the Rose Theater on Tuesday night, the pianist Ellis Marsalis noted the privilege of standing alongside his fellow honorees, both “past and passed on.” He paused to reflect on those who died last year — the pianists Hank Jones and Billy Taylor, the singer Abbey Lincoln and the saxophonist James Moody — before joining four of his sons, all accomplished musicians, for a brightly buoyant finale. That transition put an emphasis on continuity, the passing of information from one generation to the next. It was a genuine jazz moment, and fittingly so in an evening full of them. Jazz is a living art, its lexicon in a perpetual state of renewal. But it also has a clear, strong center, as an art form and as a set of practices. That’s one reason for the aftershocks that inevitably follow the loss of an important jazz elder. And it’s one more reason for the continuing cultural value of the NEA Jazz Masters awards, which have been bestowed each year since 1982 by the National Endowment for the Arts. Along with Mr. Marsalis, this year’s class includes the record producer Orrin Keepnews, the flutist Hubert Laws, the saxophonist and flutist David Liebman and the composer-arranger Johnny Mandel. (It also includes Mr. Marsalis’s sons, but we’ll get to them.) Each award came with $25,000. And the ceremony and concert, presented in conjunction with Jazz at Lincoln Center and viewable at the Web site ustream.tv, gave each honoree a warm bask in the spotlight, with many previously inducted Jazz Masters looking on, and some of them giving the introductions. And just before Mr. Marsalis took the stage to receive his award, there was a musical nod to last year’s departed Jazz Masters, as the orchestra backed the singer Roberta Gambarini and the saxophonist Jimmy Heath (Class of 2003) on a bittersweet ballad called “Angel Face.” Composed by Jones with lyrics by Lincoln, it’s not a career-defining song for either of them. But its pedigree — it comes from Lincoln and Jones’s duet album, “When There Is Love,” released on Verve in 1994 — sounded the right note about the deep current of camaraderie that jazz still cultivates. A more musically fulfilling iteration of that message came earlier, as Mr. Laws played a softly rippling version of “Stella by Starlight” with the pianist Kenny Barron (Class of 2010). Adopting a free-flowing cadence at first, they eased brilliantly into the song together, responding to each other’s signals with extraordinary poise. Mr. Laws was captivating, unerring with his intonation and luxurious in his tone. At the end of the night, Mr. Landesman also felt the need to point out something that had been deftly underplayed: Mr. Marsalis’s award was actually dedicated to “The Marsalis Family,” including his sons Branford, a saxophonist; Wynton, a trumpeter (and artistic director of Jazz at Lincoln Center); Delfeayo, a trombonist; and Jason, a drummer. Because it’s the first group award in NEA Jazz Masters history, that decision has met with some pointed criticism. The criticism stands, but so does the decision. And given the evening’s unspoken focus on legacy, it didn’t seem out of place here. A version of this review appeared in print on January 13, 2011, on page C6 of the New York edition. See the article on the NPR website. In a concert and ceremony held Tuesday at Jazz at Lincoln Center in New York, the National Endowment for the Arts recognized its 2011 class of NEA Jazz Masters. The honor is the country’s highest award for jazz artistry; those being recognized received a $25,000 grant and an opportunity to perform with the Jazz at Lincoln Center Orchestra. The event was broadcast live through XM Satellite Radio, WBGO-FM and online — with a live video stream — at this page on NPR Music. This year, the NEA recognized four individuals — three musicians, plus one record producer to be presented the A.B. Spellman Award for Jazz Advocacy — and an entire musical family. Flutist Hubert Laws and saxophonist David Liebman are known largely for their playing over multiple decades; Laws has extensive experience in many styles, while Liebman is also a noted educator. Johnny Mandel started his career in music as a jazz trumpeter and trombonist, but is primarily known as a composer and arranger for jazz, pop and films. Orrin Keepnews produced and reissued many classic recordings for his own Riverside Records and several other labels. And there’s The Marsalis Family, this country’s unofficial first family of jazz. Father Ellis Marsalis, the great pianist and teacher, helped to raise the saxophonist Branford, trumpeter and composer (and Jazz at Lincoln Center Artistic Director) Wynton, trombonist Delfeayo and drummer Jason. 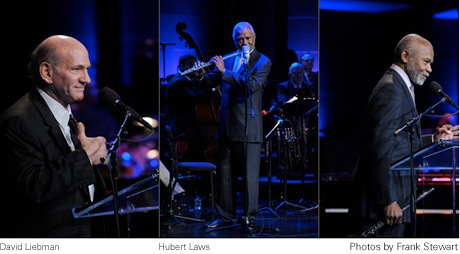 The Jazz Masters were celebrated with performances by The Jazz at Lincoln Center Orchestra, including special collaborations with Liebman, Laws and the Marsalis Family. The orchestra, with special guests — saxophonist Jimmy Heath and vocalist Roberta Gambarini — also recognized Jazz Masters who have died in 2010, with a tribute to Hank Jones, Abbey Lincoln, James Moody and Dr. Billy Taylor. Since 1982, the NEA has recognized 119 Jazz Masters (or group awards), all of whom were living at the time of their selection. In addition to the one-time grant, recipients are also invited to participate in NEA-sponsored live performances and education programs across the country. 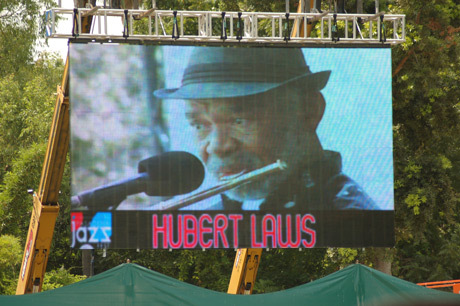 Hubert Laws showed over the weekend that he is a classic jazz flutist in more ways than one. Whatever direction he went, Laws plays with remarkable discipline and ability, handling the flute with dexterity and crystalline clarity. He has not lost one bit of the technique that started to make him well-known in the mid-’60s. Helping to create a full sound from the quintet were Pittsburgh native pianist David Budway and keyboardist Rob Mullens. The latter provided all sorts of electronic sounds without getting showy, so easy with those keyboards. He offered subtle voices of vibes and string harmonies while Budway provided intense work, also in the jazz and classical feeling. Laws also was joined by a former student, Delandrea Mills, who is living in Baltimore, who performed with him on alto flute on the Timmons song. SJT: I don’t think you’ll ever retire, but I’ll ask anyway; will you? HL: How can I retire when I’m still growing musically? It’s the strangest thing; I used to spend so much time hoping to play classical flute perfectly. I realized that no one can do that but it didn’t stop me from trying to achieve the highest level of that skill. Little did I realize something that was inherent in me is the ability to improvise – to play jazz. It’s just like having a woman, a presence in your life, who is great for you and you don’t look at her that way. The “woman” was in my life from the beginning, but I just took her for granted. I felt I didn’t have to spend that much time on her – her being jazz improvisation, in my early years. That said I took my own ability to improvise for granted, but learned that this art of improvisation is a challenging one. SJT: Tell me about your early exposure to music then. HL: I went to church with my parents where I would hear people shouting and improvising with gospel music and there I learned to play gospel music. And right across the street from my childhood home was a honky-tonk named Ms. Mary’s Place, I’ll never forget it, so I’d hear people like BB King and Big Mama Willie Thornton. Through my window at night, I listened to all the artists that came through there. That’s how I learned to appreciate different music genres. SJT: Did you get to indulge in jazz while at Julliard? SJT: Improvising basically means you take a melody and you vary it, which is what I heard all my life. You don’t have that latitude with classical music – you play what’s written, and you can’t make it sound the way you want it to sound. Since the focus of my scholarship to Julliard was classical flute I guess what I did was to take on the attitude of the establishment, which was to look down their noses, in a sense, at jazz improvisation. Lucky for me, Chick Correa would grab a bunch of us to jam and improvise, because there was no jazz program, so that was the only jazz that was going on at Julliard at that time. That’s where I began to appreciate my skill and my freedom to improvise. SJT: Why do you love jazz improvisation? HL: I love it because it is something that is very personal and unique to each musician’s creativity. SJT: So what musical genre brings out your deepest passion for playing the flute? HL: It’s all the music that I hear on a daily basis that keeps me passionate, whether it’s classical or jazz. In jazz improvisation I’m trying to bring some content, or to make musical statements that will keep people listening. That’s the challenge. SJT: To what do you attribute your longevity in the music world? HL: Longevity? I think if I had stayed only with one idiom, like classical music, I’d be like some of those other fatalities, people who would not go beyond the boundaries of the orchestra. I can move from classical, to jazz or even to R&B if I have too. That and my interest in growing is what keep me relevant. A jazz musician produces on the spot. Just like an orator has to put his own words to a speech, jazz is like having to put meat on the bones, so to speak. SJT: Who did you meet early in your career that you feel played a profound role in expanding your musical capabilities? HL: I don’t think it was one individual. I think it runs the gamut from my mother, who was influential when she took me to church for gospel music, to the variety of highly achieving artists I’ve been blessed to share a stage with. SJT: Do you write new music? HL: I haven’t written a single note of music since I’ve been married. I’m telling you (laughing)! But I recently recorded Rachmaninoff’s Piano Concnerto No. 2, but adapted it for flute. SJT: Are there recordings that you go back to listen to with a new appreciation for them? HL: Of course! I listen to people who are very economical with notes. I think about Count Basie – he was a guy who didn’t play a bunch of notes, Miles Davis did the same thing, Coltrane – Coltrane played a lot of notes but he also was economical in a way, so all of those things influence me now. I’m in constant metamorphosis, there’s a change going on all the time, and that’s what keeps me so interested. SJT: Where do you record? HL: I have my own studio. I have recorded the last five albums on my own in my studio. I do the flute myself, but for other sounds, I depend on a man named Chris Brown. I love recording on my own. SJT: What’s the most valuable piece of advice you’ve ever received about music? HL: “Practice while you’re young because when you get older you’ll have less time!” Julius Baker, my flute teacher at Julliard, told me that. I apply that advice to whatever I’m doing, because time is valuable. I grab time. I grab space to continue to improve. And Baker was right, when you get older time just flies by you.